In joint operations where both ships and aircraft are employed close coordination between the units involved is necessary. Rapid and accurate communications are essential in order to attain this coordination. In large-scale operations the heavy volume of radio traffic becomes a serious problem. Numerous visual methods and abbreviations are used to help solve the difficulty and lessen traffic on radio circuits. The majority of these signals are taken from the General Signal Book. It is mandatory that CIC personnel familiarize themselves with this book, at least to the extent of knowing how to use it. There are in addition a number of signals in general use derived from sources other than the General Signal Book. These may come from standard fleet publications or may come into being from continuous usage or may even be devised by a task group commander for a specific operation. 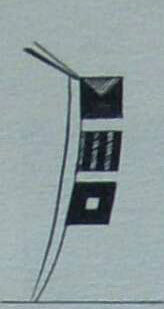 There are several flag signals that are used so often their meanings become rapidly known to CIC personnel. If report comes in via sound powered phone or squawk box that "Fox is at the dip on Mohawk," the CIC watch officer understands that the ship whose call is Mohawk is preparing to launch or receive planes. "Fox is two-blocked on Mohawk" means Mohawk is actually ready to receive or launch. In periods of low visibility, or when a carrier is so far from its group that flags cannot be clearly seen, the position of the signal flag may be stated verbally over an appropriate voice radio circuit, such as TBS. "Clipper this is Topaz. Fox is two blocked. Out." This will advise the formation that though they cannot see the Fox flag on Topaz, the latter is ready to launch or receive planes. Flags are used at the ramp to relay messages to planes and these in turn will be announced to CIC via sound powered phones or the squawk box. A red flag displayed at the ramp means: Ship not ready. Do not attempt to land. A red flag and a yoke flag displayed at the ramp means: All planes except disabled planes stay clear of the landing circle. 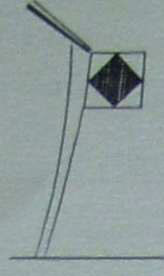 A white flag displayed at the ramp means: Planes may land. To lessen traffic on circuits and to keep the channels clear for priority information, the pilots have an elaborate set of signals for routine messages. Also if radio silence is in effect or radio in a plane (s is out, these visual signals are the means of communicating plane to plane. Planes flying in close proximity can always communicate with one another by Morse code by slapping the side of the cockpit canopy. 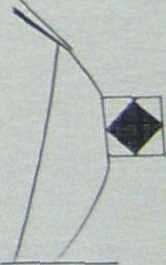 A dash is indicated by the open hand and a dot is indicated by clenched hand. There may be times when these signals may also be used for relaying messages between plane and ship. How much fuel do you have? (The pilot cups his hand to his mouth as if drinking.) 155 gallon (the answer is made by holding up the appropriate number of fingers--one finger, five fingers, and five again). An affirmative is indicated by the pilot nodding his head. A negative is indicated by the pilot shaking his head. Blinker signals are also used to supplement or replace flag signals. Low-flying CAP are generally given landing instructions via blinker. High-flying CAP are generally given "Prep Charlie" via radio and then at lower angles are given "Charlie" by blinker signal. To reduce volume of radio traffic ASP may be instructed to check visually and not to open on radio except in emergencies, receiving landing instructions via blinker signal. P.--. C--.--. "Prep Charlie" meaning: Prepare to land. C--.--. "Charlie" meaning: Land aboard. D--.. "Dog" meaning: Delay landing, return to P. C. status. K--.-- "King" meaning: Proceed on mission assigned. M-- "Mike" meaning: Proceed to base or carrier in accordance with doctrine or orders. There are further signals indicated by maneuvering aircraft that relay messages back to other planes and ships. Water landing or survivors in the water. Position of a submerged object that is a menace to friendly surface forces, i.e., mines, coral heads, reefs, etc. If a plane sights a submerged submarine and has no weapon to attack, it will make a series of dives to identify the submarine's position to nearby forces. The lowest point of the dive indicates the submarine's position. If a plane dives low over a surface vessel and stays low on a constant heading, it is indicating the bearing of a forced landing or of survivors in the water. A plane flying by on the portside with wheels, hook, and flaps down indicates the pilot desires a delayed forced landing. A plane flying by on the starboard side with wheels, hook, and flaps down indicates the pilot requests an emergency forced landing. Plane approaching from stern with flaps down, usually means the pilot is making a pass for a message drop. Rocking of wings after a message has been sent acknowledges receipt. A few examples of special signals which pertain to control of aircraft have been explained here. It should be stressed that these signals are subject to frequent changes and that new signals will come into use from time to time as the need arises. "A" BAND--An IFF frequency band. "A" SCOPE--A radar cathode-ray tube which indicates the presence of a target and its range by means of trace deflection. ACI OFFICER--Air combat information officer. ADC--Air defense commander. AEW--Air-borne early warning radar system. Air CONTROL SHIP--Ship having air control duty. Air CONTROL NET--Radio circuit used by the controller in controlling aircraft. AIR COORDINATOR--An air-borne officer who coordinates air activity during an amphibious operation. AIR LIAISON PARTY--The shore based intermediary between the air coordinator and ground troops. AIR OFFICER--Head of the air department on a ship. AIR OPERATIONS--Space on a carrier in which air department work is coordinated. AIR STRIKE--A flight of aircraft on an offensive mission against a ground or surface target. APPROACH PHASE--Initial stage of an amphibious operation. ASSAULT PHASE--Intermediate stage of an amphibious operation. BLIP--Indication on a radar scope. BPS-1--An attack radar for submarines. BPS-2--An air search radar for submarines. CATHODE RAY TUBE--The indicating unit or time measuring device used on all radars. CCA--Carrier controlled approach radar system (experimental). CIC OFFICER (SHIPS)--Officer in charge of combat information center. CIC WATCH OFFICER--An officer qualified to stand condition watches in CIC. CLAA--Light antiaircraft cruiser with main battery of 5-inch guns. COMBAT INFORMATION NET--Radio circuit used for passing information between CIC's on different ships. COMMAND SHIP--Ship from which an amphibi ous operation is directed. CONSOLIDATION PHASE--Final stage of an amphibious operation. CONTROLLER--Officer controlling fighters to effect an interception. CW--Continuous wave radio transmissions sent by key. D CAP--Day combat air patrol. DADCAP--Dawn and dusk combat air patrol. DEVIATION--Error in a magnetic compass caused by ferrous metals in the vicinity. DR--Dead reckon. DRECCO--Daytime long range air search. DUMBO--A PB type aircraft used for air-sea rescue purposes. FADE--Disappearance or weakening of echo on a radar screen. FADE CHART--Chart of radar field showing areas where targets will fade for a specific radar. FADN--Fighter air defense net. Fly Sheet--Bulletin issued daily by air operations listing scheduled flights, with plane numbers and personnel. FORCE CIC OFFICER--Officer who coordinates the work of all CIC's in a task force. "G" BAND--An IFF frequency band used primarily with fighters. GCA--Ground controlled approach radar system. GRID--A chart laid off in rectangular coordinates. GROUP CIC OFFICER--Officer who coordinates the work of all CIC's in a task group. Gulls--Radar deception devices. Heckler--A small night air strike. H/F or HF--High frequency. HUNTER/KILLER--Combined air-sea operations conducted against submarines. IFF--Identification friend or foe--An instrument used to identilv friendly units on a radar. Intercept Ship--Ship which attempts to detect enemy radar transmissions. Interrogator--The challenging unit of an IFF system. INTRUDERS--Target night combat air patrol. 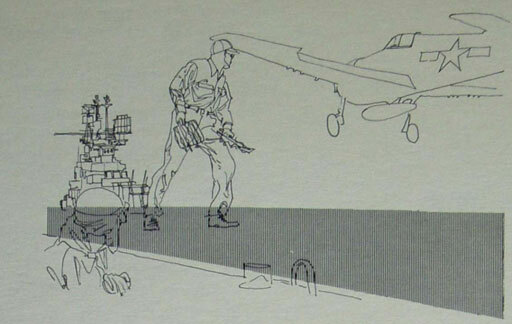 JACK PATROL--A type of antisnooper patrol (air-borne). JAMMER--An electronic transmitter used to obliterate information on radar scope. JAMMING--The obliteration of information on radar scopes. JAMMING SHIP--A ship assigned the duty of operating a jammer in order to reduce the effectiveness of enemy radars. JL--A sound-powered circuit aboard ship used principally by the lookouts. JOINT OPERATIONS--A space aboard a command ship from which an amphibious operation is directed. JS--A sound-powered circuit aboard ship used to pass radar information. "L" BAND--A radar frequency band. LOBE--A part of the transmitting and/or receiving pattern of a radar antenna. LSO--Landing signals officer aboard an aircraft carrier. MAPHO--A flight of aircraft assigned to make precision photographs of a land area. MC--A designation used for certain internal communication systems aboard ship. MPI--Mean point of impact of a salvo. NIGHT AIR CONTROLLER--Officer controlling fighters to effect an interception at night. NRECCO--Night-time long range air search. NULL--An area in a radar field where no signals or weak signals returns occur. "P" Band--A radar frequency band. PHOTO PATROL--A flight of aircraft flown for the purpose of taking photographs. PICKET--A unit of a task group operating at a distance from the group. To provide early warning of enemy forces. POINT OPTION--The expected average course and speed of a ship. PPI--Plan position indicator--A radar cathode-ray tube which gives a plan view of the area around the radar and from which both range and bearing of a target can be obtained. RADAR--A radio detection and ranging device. RADAR COUNTERMEASURE SHIP--Identical with a jamming ship. RADAR GUARD SHIP--A ship assigned to maintain a radar watch. RADAR PICKET--A picket ship assigned to main-tain a radar watch. RADAR TELLING NET--A radio circuit used fo exchanging radar reports over a large area. RAPCAP--Radar picket combat air patrol. REDRECCO--Reinforced daytime long range air search. RLANE PLANE--A plane employed to relay radio messages. RESPONSOR--The unit which receives IFF signals from the transponder which is in the challenged station. "S" BAND--A radar frequency band. SC, SC-1, SC-2--Air search radars. SCOCAP--Scouting line combat air patrol. SCR-527--Shore based altitude determining radar. SHACKLE CODE--A code used to encipher numbers. SMOKER--A plane equipped to lay smoke screens. SPN-8--A short range carrier controlled approach radar. SPS-1--An air and surface search radar for destroyers escorts and above. SPS-2--A long range air search radar designed for large ships. SPS-3--A hemispherical search radar designed for destroyers and above. SPS-4--A zenith and surface search radar for destroyers and above. SPS-5--A surface search radar designed for PT's and above. SPS-6--A series of new air search radars designed for destroyers, cruisers, and carriers. SPS-7--A surface search radar designed for PC's and above. SUBCAP--Bescue submarine combat air patrol. Sweep--An air strike composed entirely of fighters. Target Coordinator--An air-borne officer who directs and coordinates the execution of an air attack. TFC or GTF--Task force commander. TGC or CTG--Task group commander. TOMCAT--A destroyer picket which can home planes with YE or YG. TRANSPONDOR--The receiving and answering unit of an IFF system. VARIATION--Difference in hearing between the North Pole and the Magnetic North Pole. VISUAL FIGHTER DIRECTION--The controlling of fighters to effect an interception using visual data in lieu of radar data. WATCHDOG--An advanced fighter direction picket. "X" BAND--A radar frequency band. YE--A radio device for homing planes. YG--A radio device for homing planes. YJ--A radar device for homing planes. ZB--Radio equipment in aircraft to receive YE or YG signals. Figure 214.--And it will be the end if this is the way you run your CIC.